I just developed a new "static" 3D phylomorphospace function; i.e., one that uses R base graphics to simulate three dimensions in a static plot, rather than the rgl library. The advantage of a static plot over a (much more impressive looking) spinning dynamic plot is that it is much easier to modify the plot using base graphics, and it can be exported in standard formats or combined with other plots. Code for this new version is here. 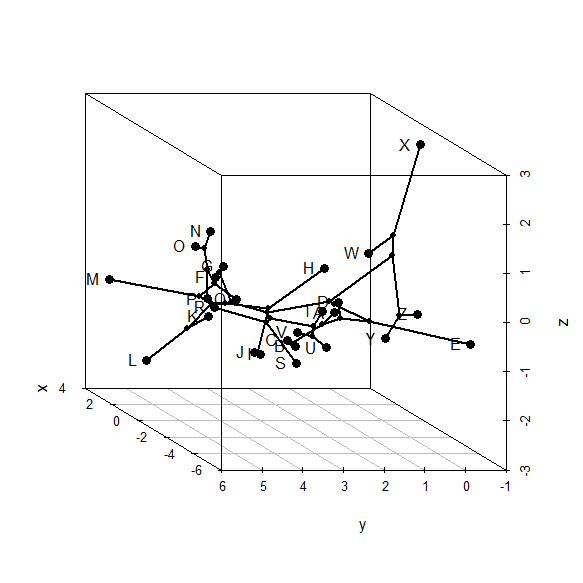 The method uses scatterplot3d internally. It is also in a new phytools build (phytools 0.3-40) which can be installed from source. Obviously, the dynamic plot makes it a lot easier to see depth in the 3D plot; but the flat plot has the advantage of being something that we can more easily print to a page or combine with other R graphics. I tried to install the newest version phytools because I need to make 3D static graph (I will put it in my next scientific paper), but I did not have any luck. cannot open compressed file 'phytools_0.3-40.tar.gz/DESCRIPTION', probable reason 'No such file or directory'"
I tried to do it manually (copied folder to R library but that did not help). and then select a mirror repository. I know this post is a few years old, but I was wondering if you can assist me with some issues I'm having with using fancyTree() to create a static 3D phylomorphospace plot. The resulting plot is very "squished" and I can't seem to make the margins smaller so that the plot itself is visible. I've tried adding a mar= argument like in scatterplot3d() but it doesn't change anything. I've also tried to reset my graphics default margins, but that does not seem to help either. Additionally, I was wondering if it is possible to add phylogenies to an existing plot in order to show multiple in the same plot?